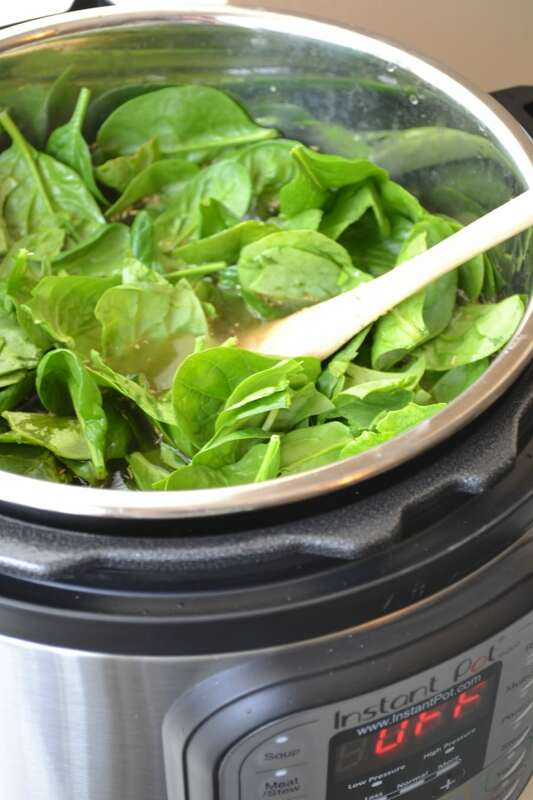 Are you thinking about getting an Instant Pot? Do you have one, but you’re not sure what to do with it? Are you totally clueless about what an Instant Pot even is? If you’ve got questions about the Instant Post, this post should answer them. I’m never the first person to jump on a new cooking trend or kitchen appliance, but if I keep hearing good things about something, eventually curiosity gets the best of me. Over the past year or so, I’ve heard quite a bit about the Instant Pot, and I finally bit the bullet, bought one for myself, and started testing it out. I’ve gotten quite a few questions from curious friends, family members, and blog readers about my new little gadget, so I thought I’d write up a post to share my early experiences and save y’all the hassle of having to dig through Google to figure stuff out (like I did). If you’ve got Instant Pot related questions that aren’t answered by this post, feel free to ask in the comments, and I’ll do my best to find answers for you. Essentially, an Instant Pot is a modern day pressure cooker. When I was growing up, my parents had a pressure cooker, and I remember being equally terrified of it and fascinated by it because of how it shook and whistled and acted like it was about to explode any moment. The Instant Pot is much less scary. It still pressure cooks, but it doesn’t shake or make crazy noises, and since it’s digital there’s a lot less guesswork involved in figuring out how to set it. Once you familiarize yourself with the settings, it’s essentially a “set it and forget it” type of device. Now that Instant Pots have become so popular, you can find them at Target, Walmart, and virtually any department store that sells home goods. I purchased my Instant Pot from Amazon because they offered the best price at the time, and I could have it delivered quickly via Amazon Prime, which made things that much simpler. How will an Instant Pot make my life easier? The main reason that I personally chose to get an Instant Pot is that it’s essentially a slow cooker on speed. I love my slow cooker, but I don’t always have the time (or the foresight) to get my meals in it early enough to have them ready for dinner time. With an Instant Pot, you can have falling-apart braised meats, stews, beans and “cooked all day” flavor in minutes instead of hours. 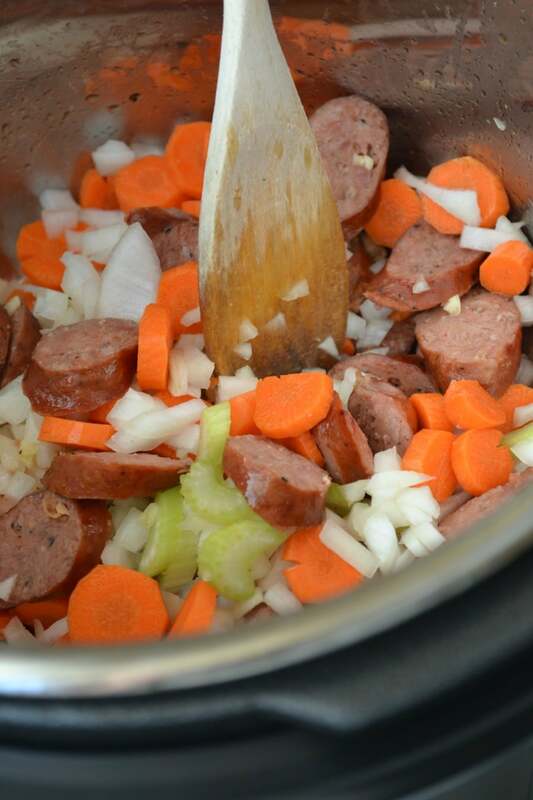 PLUS, you can saute right in the Instant Pot, so if you’re making soup or chili or a meat dish that requires searing, you do it right in the pot, and then just switch the setting when you’re ready to pressure cook or slow cook the ingredients. Granted, I’m at home a lot during the day so it’s not a big deal for me to put stuff in the crockpot at 10:00 and monitor it throughout the day to switch it from high to low, etc. But there are days when I can’t do that, and it’s nice to still be able to make a “slow cooked” meal without the lengthy slow cooker cooking time. Take chili for example. If I make chili on the stove, it’s nice because I can do the browning and cooking all in one pot. But my 30 minute stovetop chili isn’t quite as good as chili in the slow cooker because the flavors don’t have as much time to mingle, and sometimes the beans, onions, and chiles (if I’m using them) don’t get as tender. With the Instant Pot, I can make a 30 minute chili that tastes like it’s been slow cooking all day long. Another advantage: cooking dried beans quickly. I’ve always loved the taste and texture of beans that have been cooked from dry vs. canned, but they typically involved a lot of pre-planning because you’ve got to soak them for 24 hours and then cook them for several hours until they become tender. The Instant Pot can cook dried beans in about 20 minutes. You can cook frozen meat without thawing. So, if you’ve got chicken breasts in the fridge, but they’re frozen solid, you can just throw them in as is and still have tender chicken ready to use in a soup, enchiladas, or another dish in just a few minutes. You can also cook hardboiled eggs, rice, porridges, yogurts and lots of other fun things. There are essentially three main Instant Pot models to choose from: a 6 qt DUO, an 8 qt DUO, and a super deluxe model called the LUX. I ruled out the super deluxe one right away because A) it’s expensive and B) I’ve learned that tons of bells & whistles often equals a headache for me and/or I don’t end up using all of the fancy features anyway. When it comes to choosing the best Instant Pot for your needs, I think that unless you have a big family or you plan to make lots of double-batches for freezing, the 6 qt will work fine. I’m sure there will be times when I might wish for more space, but I’m happy with the size of the 6 qt DUO for the majority of the needs. One thing I read in a review was that the 8 qt stands pretty tall, which can make it hard to use for sauteeing (especially if you’re a shorty like me). After using my 6 qt I can see how that would be an issue, as I practically had to stand on my tip toes to saute when it was on my kitchen counter. If it turns out I need more instant pot space in my life down the road, I think I’d rather have two 6-qt versions than one 8 qt because that way I can do two different things at the same time (like refried beans in one and shredded pork for tacos in the other), or make a double batch of something if I’m serving a crowd. Is the Instant Pot easy to use? 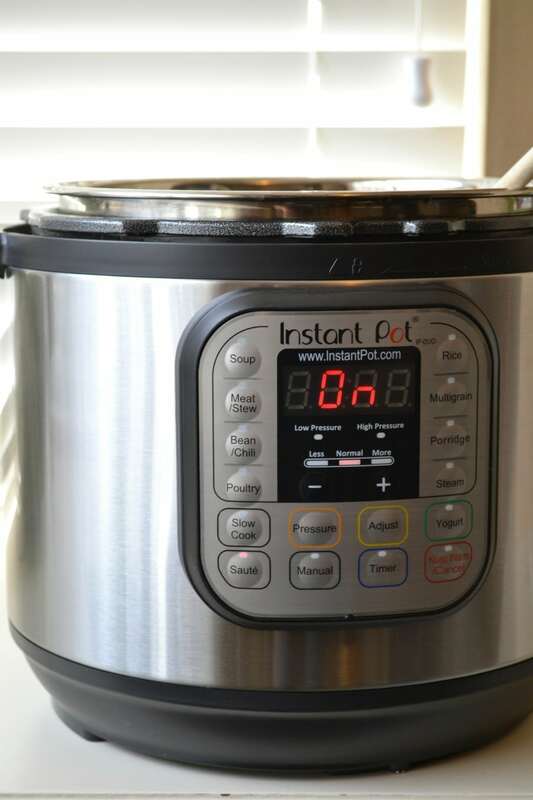 I had a few moments of head scratching frustration when I first opened the Instant Pot and started reading through the manual, but overall I find the Instant Pot to be pretty user friendly. The first day I got it, I was able to cook a batch of chili in it, so that goes to show it doesn’t take too long to figure out. I did, however, spend quite a bit of time googling things that weren’t covered in the manual. I’m answering those questions below so that you don’t have to do as much searching as I did. Why is the Instant Pot steam/vent knob so wobbly? After a little googling, however, I came to realize that the knob is SUPPOSED to be wobbly. Oops. I just wish it had said that in the manual so I wouldn’t have had to freak out unnecessarily. 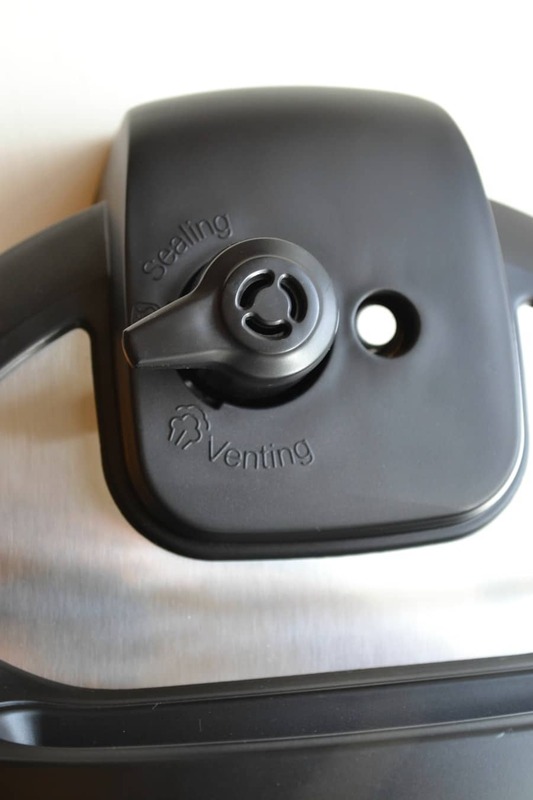 How do you get the “Anti-Block Shield” off of the Instant Pot? Another issue I had with the manual was that it claimed that you should pop off the “anti-block shield” and then put it back on again. I was confused. A) Because I wasn’t sure what the purpose of taking something off and putting it right back on again was, and B) I couldn’t get the darn thing off! The reason they want you to learn how to to take it on and off is for cleaning purposes (you should clean it after each use in case food gets stuck inside). And I also discovered that I’m not the only one who couldn’t get it off as easily as the manual would have you believe. Thanks to Google once again, I tried gently prying it a bit using a thin tip of a knife, and then I was able to get it off. I thought I’d share this in case you find yourself struggling with it as well. How do I know which settings to use? The first time I cooked a soup with beans, I was confused about whether to use the “beans” setting or the “soup” setting. It turns out, they’re the same…both buttons are set to cook on high for 30 minutes. 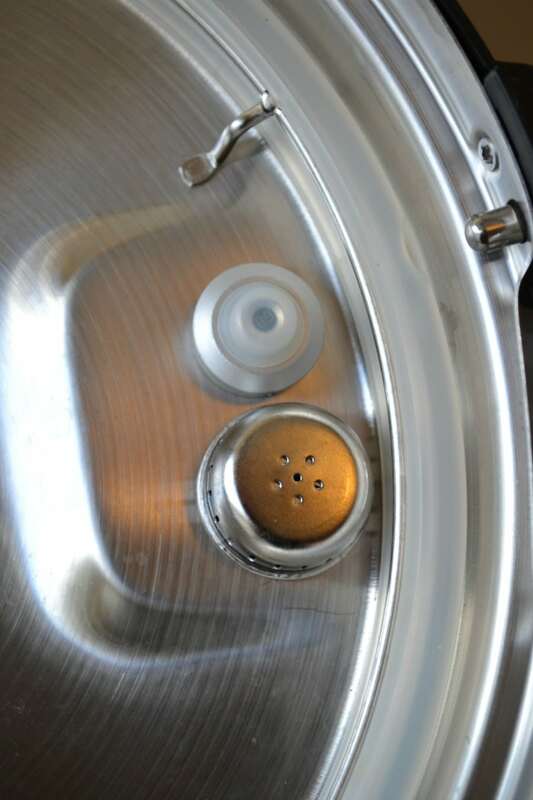 The Pressure Cooking Today website shows a general breakdown of what each button does, so that you can see how each setting relates to one another. (Look for the “button description” chart in the middle of the page). One thing you should know about the Instant Pot is that the actual cooking time is going to be longer than the number of minutes you select. After you choose your pressure cooking setting (For instance, 20 minutes at high pressure) and set it to “on,” it could take anywhere from 5-30 minutes for the Instant Pot to reach the pressure level it needs to actually start cooking the food. So if you’ve got it set for 20 minutes, you might be looking at 40 minutes or more until the food is actually done. Just keep this in mind when you’re figuring out how much time it will take to prepare a dish. Where can I find good Instant Pot tips & recipes? I recently discovered a huge Instant Pot Community on Facebook. It’s a great place to go to get ideas for what you can make in your Instant Pot, find links to recipes, figure out which settings to use, and get help if you experience an Instant Pot fail. If you find that community a little too large, there are some other Instant Pot related facebook groups as well — just search “instant pot” in the Facebook groups tab. Pinterest is another good resource. I’ve created an “Instant Pot Recipes” Board on my Pinterest page, which I’ll be adding to regularly, so if you’re a Pinterest user, be sure to check it out. Learn from my mistake: Do NOT put the Instant Pot underneath a cabinet. When you release the vent, a ton of hot steam is going to shoot up into the air…for a while. Make sure there’s nothing above your Instant Pot so that when the steam releases it won’t damage anything or cause condensation. ALSO, make sure that if you have kids (of any age), they fully understand that the steam escaping from the valve is EXTREMELY hot and could burn them. When I vented the steam valve for the first time, my 10-year-old ran over and was about to put her hand in the steam until I let out a shriek and told her to get away. To her, it probably didn’t look any more dangerous than the steam coming off a jacuzzi, but she could have been badly burned. Since then I’ve made sure both of my girls understand not to get anywhere near the hot steam. Whether you’re an Instant Pot veteran or rookie, I’d love to hear your thoughts in the comments! Do you love it? How has it simplified your life? So much great information. Thanks for linking to my site. Have fun!